The Dialog 4222 is a digital work-station system phone that delivers all the essential functions for the busy office executive. It has a two-line graphic display that makes it very user- friendly. Additionally, its terminals have a headset port, hands-free function, and its own headset key. 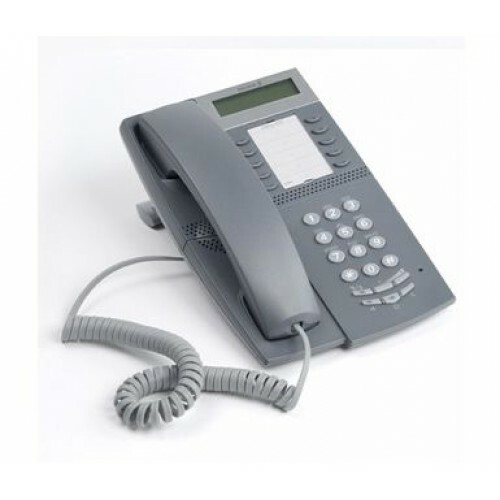 Besides the attractive dark grey colour, the Dialog 4222 office phone features a programmable ringer, tone character and loudness control. Users will also appreciate the flexible graphical two-line display, 10 function keys with LED, and programmable function keys that can be labelled for easy and quick access. Some less common features in similar phones are the LED capability to track parked, unanswered or ongoing calls; and the key panel socket for connecting an extra key panel holding 17 LED keys. Other great features that you would expect to find in this range of phones include a headset port and switch, hearing aid compatibility, and adjustable foot console. Why should you buy the dark grey Dialog 4222 phone? This desktop office-telephone is a user-friendly system terminal that is designed to facilitate all your communication needs. Besides its standard features, the Dialog 4222 has an integrated headset socket. That said, it is not headset compatible, but is compatible with Aastra MD110 phone systems. To use a Plantronics headset, you will need the Plantronics M12 Amplifier, or the GN Netcom 8000 Amplifier for it to work with a GN Netcom Headset . Got one of these phones, which is a good phone, but didn't check my headset. Had to get an extra cable to work. Other than that it's a solid phone.